Last week, CNet found a Youtube user (alias "belowtheradar") uploading copyrighted video clips that also included ads of Gizmodo and Valleywag. 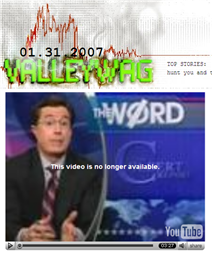 The clips were from shows such as The Colbert Report and Good Morning America. Nick Denton later confirmed that the user was Richard Blakeley, an employee of Gawker. Based on CNet's "investigation", Youtube has taken down the Gawker account and all the videos uploaded by belowtheradar (or Gawker) have been been removed from Youtube archives. The most interesting part of the story is that Gawker doesn't consider these three-second promotions as advertisements and they plan to continue the practice in the future, according to CNet. Isn't this practice same as blog plagiarism ? You are taking someone else's content without permission and then even monetizing it by pasting advertisements. Gawker is a well-respected blog network but in the above case, they are definitely setting up a wrong example.